Listen to AM1470 and FM96.1 for your chance to WIN passes to see SMALLFOOT in theatres! 遊戲日期 Game Period: September 22 - 28. An animated adventure for all ages, with original music and an all-star cast, “Smallfoot” turns a myth upside down when a bright young yeti (Channing Tatum) finds something he thought didn’t exist—a human. 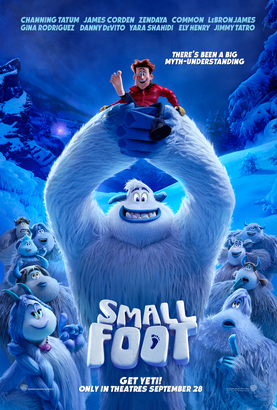 News of this “smallfoot” (James Corden) throws the simple yeti community into an uproar over what else might be out there in the big world beyond their snowy village, in an all new story about friendship, courage and the joy of discovery.